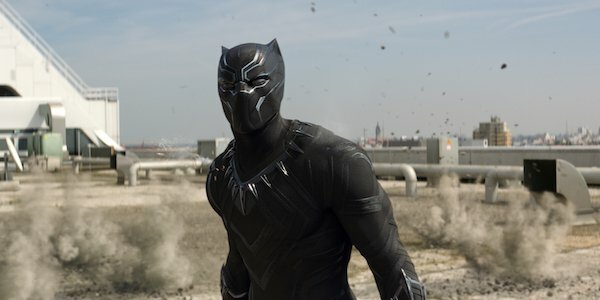 Black Panther is jumping into the Marvel Cinematic Universe next month for Captain America: Civil War, and as a member of Team Iron Man, he’ll help support the restrictions against superheroes. However, if you’ve watched the trailers, you’ve seen a few moments of T’Challa tangling with Bucky Barnes, a.k.a. the Winter Soldier, whether it’s knocking him off his motorcycle or kicking him in the face. While we’ve mainly been led to believe that Black Panther is trying to capture Bucky for a horrible crime he’s been framed for, it turns out there will indeed be a personal component to his hunt: capturing his father’s murderer. In EW’s coverage of why the Captain America: Civil War protagonists are “angry,” they mention that Black Panther’s father “isn’t around anymore,” and now T’Challa has set out to make Bucky Barnes pay not only for his crimes, especially the ones against his own family. This confirms that T’Chaka is dead in the MCU, and T’Challa blames Bucky for his father’s death. That could be extra incentive for T’Challa to work with Tony Stark, as Steve Rogers will do whatever it takes to protect his friend from decades past. What’s unclear about this information is exactly when T’Chaka died. In the first Captain America: Civil War trailer, there was an explosion at what looked like the United Nations, and in the second trailer we saw T’Challa emerging from the wreckage. Perhaps T’Chaka accompanied T’Challa to the United States, but was tragically caught in the attack, which is presumably what Bucky has been framed for. On the other hand, we have to remember that Bucky spent decades as the brainwashed Winter Soldier, assassinating any target HYDRA deemed necessary. Since T’Chaka was killed in the comics when T’Challa was a child, maybe that also happened in the MCU. After all these years later, Black Panther finally has the perfect opportunity to carry out his revenge, though the report does mention that his father wouldn’t condone such a quest. Whenever T’Chaka’s death occurred and whether Bucky was truly responsible for it, we the fans know that he isn’t trying to do any wrong in the present day. After breaking free from HYDRA’s control at the end of Captain America: The Winter Soldier, Captain America: Civil War will see Bucky trying regain his memories and seek redemption, but when he’s framed for a crime he didn’t commit, he’ll find himself on the run from both authorities and the superheroes who are going along with the Sokovia Accords. His fugitive status, along with the disagreements over enhanced individuals being regulated by the government, will lead to the protagonists clashing, and from what we’ve seen so far, Black Panther is taking every opportunity to slap Bucky around. Considering what he believes the metal-armed soldier did to his father, it’s not entirely unreasonable, though we’ll soon find out if it’s warranted or not.